A collection of photographs of the Three Stooges – Moe Howard, Larry Fine, Curly Howard, Shemp Howard, Joe Besser, and Curly Joe DeRita. The traditional opening to the Three Stooges short films, with the head shots of Moe, Larry and Curly (spelled “Curley” here, as in many of their early shorts). Another photo still of the Three Stooges – Moe, Larry and Curly – on the golf course from their short film, Three Little Beers. Photographic image of the Three Stooges (Moe, Larry and Curly) from their famous anti-Nazi short film, You Nazty Spy. Photograph taken from the Three Stooges short film, All Gummed Up starring Moe, Larry and Shemp, and co-starring Stooges regulars Christine McIntyre and Emil Sitka. The Three Stooges (Moe, Larry and Curly) as policemen in a publicity still, most likely from Dizzy Detectives. A publicity still has the Three Stooges ready to kick off for some football, with Moe and Larry using Curly’s head as the kicking tee! Most likely from their short film Three Little Pigskins, where they play college football – where Lucille Ball has a minor role as a gangster’s girlfriend as well. Another still from Three Little Pigskins, colorized this time, showing Curly, Moe and Larry in their uniforms and helmets. The Three Stooges (Moe Howard, Larry Fine, and Curly Howard) as the Wrong Brothers in Dizzy Pilots (1943) – trying to sell their newly-invented airplane, the Buzzard, to the military. The Three Stooges (Moe Howard, Larry Fine, Curly Howard) in a publicity still from their 1943 short film, Phony Express. Publicity still of the Three Stooges (Moe Howard, Larry Fine, Curly Howard) from the 1930’s. A still from the Three Stooges short film, Spook Louder (1943) – their first “haunted house” movie – starring Moe Howard, Larry Fine, and Curly Howard. The Three Stooges (Moe Howard, Larry Fine, Curly Howard) in a publicity still from Phony Express (1943). The Three Stooges (Moe Howard, Larry Fine, Curly Howard) as inept plumbers in a scene from their short film A-Plumbing We Will Go (1940). The Three Stooges (Moe Howard, Larry Fine, Curly Howard) as firefighters in their short film False Alarms (1936) where they have to put out a fire … their own fire station! Another still image from the Three Stooges short film False Alarms with the Stooges (Moe Howard, Larry Fine, Curly Howard) in their fire truck outside their fire station. Publicity still from the Three Stooges short film Wee Wee Monsieur (1938) where Moe Howard, Larry Fine, and Curly Howard inadvertently join the French Foreign Legion. The Three Stooges – Moe Howard, Larry Fine, and Curly Howard – in a publicity still, with Curly’s head in a vice. Another photographic still from the Three Stooges short film All the World’s a Stooge (1941) with the Stooges (Moe Howard, Larry Fine, Curly Howard) not only dressed as children, but acting childish. Photograph of Shemp Howard, the original third Stooge, who left the group to pursue a successful individual career in the movies, and who later rejoined after Curly’s debilitating stroke, staying with the group until his own death. Photograph of Curly Howard, the most popular third Stooge of the Three Stooges. Photographic still of the Three Stooges (Moe Howard, Larry Fine, Curly Howard) preparing to pull one of Curly’s teeth with a pliers from the Three Stooges short film I Can Hardly Wait (1943). Publicity still from the Three Stooges short film Crash Goes the Hash (1944) starring Moe Howard, Larry Fine, Curly Howard. Publicity still from the Three Stooges short film Monkey Businessmen (1946) starring Moe Howard, Larry Fine, Curly Howard. Photographic still from the Three Stooges short film Micro-phonies (1945) which featured Curly (as Madame Cucaracha) lip-synching to the singing of Christine McIntyre (in her debut with the Stooges), with the aid of Senor Mucho and Senor Gusto (Moe Howard and Larry Fine). Photograph still from the Three Stooges short film A Bird in the Head (1946) starring Moe Howard, Larry Fine, Curly Howard. Publicity still from the Three Stooges short film Gold Raiders (1951) starring Moe Howard, Larry Fine, Shemp Howard. Photograph from the Three Stooges short film So Long Mr. Chumps (1941) starring Moe Howard, Larry Fine, Curly Howard. Publicity still for the Three Stooges (1940’s) – Moe Howard, Larry Fine, Curly Howard. Publicity still of the Three Stooges – Moe Howard, Larry Fine, Curly Howard – in tuxedos. Publicity photo of the Three Stooges – Moe Howard, Larry Fine, Curly Howard. Publicity photo of the Three Stooges in the 1940’s – Moe Howard, Larry Fine, Curly Howard. Publicity photo of the Three Stooges – Moe Howard, Larry Fine, Curly Howard – taken in the 1940’s. Publicity photo of the Three Stooges (Moe Howard, Larry Fine, Curly Howard) as the Wrong Brothers, trying to start the engine of their new airplane, the Buzzard, in Dizzy Pilots (1943). Publicity photograph of the Three Stooges – Moe Howard, Larry Fine, Curly Howard – taken in the 1930’s. Publicity photograph of the Three Stooges (Moe Howard, Larry Fine, Curly Howard) in Western garb, taken in the 1940’s. Photograph taken from the Three Stooges short film Gents Without Cents (1944) starring Moe Howard, Larry Fine, Curly Howard. Publicity photo for the Three Stooges short film, Phony Express. Publicity photograph for the Three Stooges for one of their short films, with Curly’s head on a platter. Publicity photograph for the Three Stooges – Moe Howard, Larry Fine, Curly Howard – dressed as servicemen returning from war. I’m looking for a photo or poster of the three stooges reading an old stock ticker. saw it years ago in a store and have seen it since. can anyone help direct me to a copy of this? 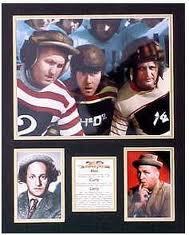 I’ve been searching for a football posters of the stooges from three little pigskins. I could have sworn there was a poster with the three of them wearing football uniforms from that movie. Anyone have any info on that? It took a little hunting, but I found one (colorized) on Amazon.com, and added it – let me know if that’s what you’re looking for; thanks!